The Human Services program prepares students for entry-level positions in a variety of educational and social service professions and for transfer to bachelor’s degree programs at institutions of higher education throughout the country. 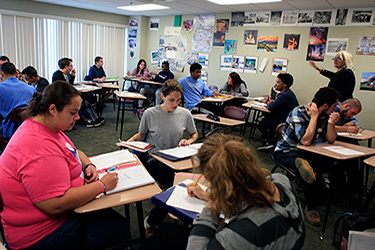 The sequence of competency-based courses required for the associate degree combines classroom and fieldwork experience in the areas of child development and family relations, early childhood education, public school education, child and adult services for special needs populations, social work, gerontology, mental health and substance abuse. All students complete three internships in a school, agency or program setting in their chosen concentration. Each concentration provides 50 to 90 hours of field experience and a corresponding seminar for educational and clinical supervision. This provides students with a well-integrated balance of theory and practice for personal and professional development. Graduates of the Human Services program perform a variety of educational, therapeutic, supportive and direct service functions for diverse individuals of all ages with educational, emotional, social, developmental and physical needs. OPTION 1: Enter employment directly upon graduation. Students often are offered a position in the school or agency where they have completed their internship. OPTION 2: Transfer to a four-year college. Human Services faculty are readily available to assist with CCRI course selection that will prepare students for transfer. OPTION 3: Enter the workforce while working toward completion of a bachelor’s degree. This is one of the most common options selected by CCRI graduates.